As the COP22 climate summit in Marrakech winds down, ministers from Brazil, South Africa, India and China (BASIC) came together to brief the media on the progress made during the conference. The group confirmed on the eve of the closing of the "COP of Action" that much remained to be done to address the common demands of developing countries, especially in the area of finance. After reaffirming their faith in the UN climate convention and welcoming the early entry into force of the Paris Agreement, the group expressed disappointment in the lack of substantive progress on pre-2020 action on the part of developed nations. Apart from the obvious shadow of the election of Donald Trump, the two topics that dominated the interaction were the US$100 billion per year to be mobilised by developed countries by 2020 and the anchoring of the adaptation fund in the Paris Agreement. "We are still working towards the realisation of the $100-billion goal by 2020 and technical work is still required for a balanced and fair implementation of the Paris Agreement. 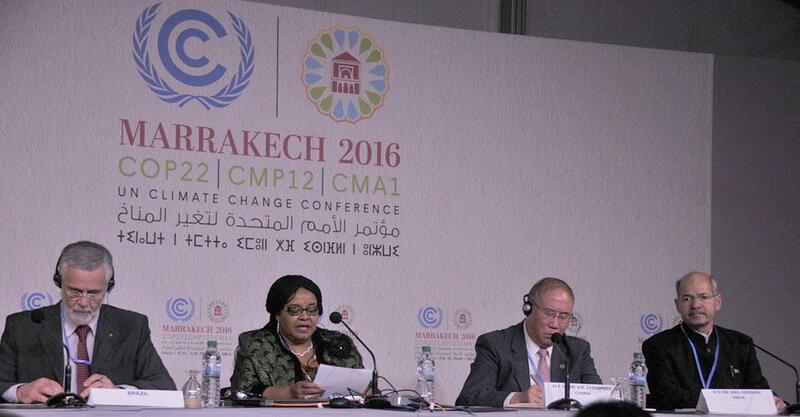 One of the demands that remains to be sorted out is the anchoring of the adaptation fund in the Paris Agreement... the adaptation fund and finance are issues that are still to be discussed and resolved," said the South African environment minister Edna Molewa during the briefing. The Chinese special representative on climate change issues, Xie Zhenvia, also demanded that the $100-billion commitment by developed nations be met and that the terms in the Paris Agreement regarding finance were very clear and that there should be no attempt to negotiate or change them. At least partly motivated by the prospective effects of an imminent Trump presidency in the US, the group stated that there must be no attempt at renegotiation or withdrawal from the Paris Agreement. "Parties need to reaffirm action and support; the agreement is an irreversible pact. Investing in renewable energy and reducing the emission footprint makes political, economic and social sense," said Molewa. But addressing the numerous questions from the media on the impact and reactions on the US election results, the group appeared to agree with Indian environment minister's stance that they would "wait and watch." "Countries need to honour their commitments and honouring the Paris Agreement will solve all problems" claimed the Xie Zhenvia. The Chinese minister also said that Beijing’s commitment and position in pursuing climate action will remain unchanged and that cooperation would preferred even during the Trump presidency. Donald Trump has in the past called climate change a hoax perpetuated by the Chinese. Droughts have crippled food production in several developing and vulnerable countries, especially in Asia and Africa, over the past decade and much of this is attributed to climate change and errant weather. The inclusion of agriculture in COP mechanisms has been another long-standing demand which remains unmet even after years of negotiations and Molewa made no attempt to hide her displeasure at the lack of urgency shown in the matter. "I am extremely concerned that agriculture has been negotiated for seven years now but after drafts and redrafts, partners have rejected the document. This is a grave concern we have been raising time and again," said the South African minister without mentioning any of the partners by name.